Letters from Nora-Mirabilia Design "C"
Made this for my oldest daughter-Cecilia-for her birthday. Now to find a frame. 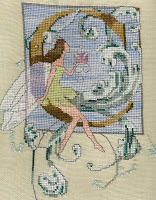 Becky Autry designed a mystery sampler for the Sampler Guild of the Rockies group. We had to choose our own colours and each mth during the summer we receive our part. This is part one complete. I didn't have too many overdyed silks to choose from and every Sat we have been busy so I couldn't get to the LNS, so these are the silks I chose. Still not too sure if I like my choices but hope it grows on me.